I leave tomorrow to head out on our journey to the midwest. We will leave bright and early tomorrow and spend the night on the way, since it is a 12 hour drive. Then Friday we will arrive around lunch time in Urbana!!! All my stuff should be moved in by then and my UPS boxes should have arrived. 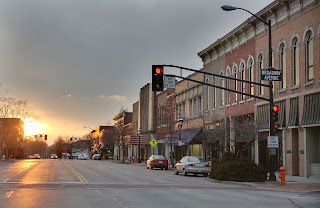 This is a picture of "Downtown Urbana", it made me super excited when I saw it online. Not sure what part of it I am really seeing but I kind of like the small town feel of this part of Urbana. I have always loved small towns as long as there was a lot to do! (And it seems like I found just the right place to go live for the next 2 years!) I will post some of my own pictures ASAP once I get there, so you can all see for yourselves the wonderful place I will be living. I haven't posted in awhile because I have pretty much been at a loss for words the past 2 weeks while I have been home from NYC. I thought if I started writing I wouldn't be able to stop, but I couldn't ever get the courage to start writing. If you know me I am a very big journaler, I love to write in my journal and I actually filled up 2 journals just while I was in Philly last summer. I deep down want to write a book one day. But I was a little worried that if I wrote down how training impacted me, it would mean I would have to say goodbye to that section of my life and admit it was over. It would mean that I would not see my wonderful fellow US-2's for a whole year for most of them. It would also mean I really had to start living out all the things I felt my ignorance had been shattered on. Also it meant the clock was ticking and I would be moving VERY VERY soon. 1. Trish came to NC for an unexpected trip, but I was the lucky one because I got to see her! Our time together was short because she has to catch a plane back north, but it was some much needed time. It was good for me to see her because she has been the biggest inspiration to me for wanting to become a missionary. Also the reason I am going into this US-2 program is also because of my experience in Philly last summer. My heart was broken for the people in that community and I will never be able to shake that. Even though my ministry will not be in Philly the next 2 years, I realized I can minister from a far. Just by being a friend to Trish, to listen to the hard times, and just to be there to joke with when things are good or bad. I love her so much and can't even imagine how my life would be if I had never met her and lived with her last summer. 2. I got to see Greg (my fellow US-2 from NC who is going to Baltimore and knows so many of the important people in my life, Brad, Kelly, Daniel, Frank & Carisa, etc...) We had a wonderful time catching up a little and also sharing about how we have felt the last 2 weeks. We realized we BOTH had not been able to write in our journals (he is also an avid journal writer). We pretty much came to the same conclusions of why, but it was good because we both really hadn't taken the time to figure out why we couldn't write. It was also nice to hear that he has had similar feelings since we got back about missing everyone. It is good to know we are not alone in all of this. It was much needed for me to see apart of our US-2 community and be reassured we would always be there for each other in the next 2 years. Thanks Greg! 3. I got to spend some wonderful time with 3 of my FAVORITE people, Kelly McRell, Daniel Corpening, and Kara Brown. I cannot tell you how influential these 3 people have been in my life over the last few years. I will start with Kelly: she is just such a joy in my life and can always make me laugh, she wants to save the world and has the passion to do so, she embraces everyone and is such a seeker for God, I love the talks we have, and I am so glad she knows she can come to me with struggles and joys and I can do the same for her, she has grown so much this summer and I have never been more proud of her than I was this weekend! I needed to see her, and when we left she prayed for me and for the next 2 years. I was overwhelmed at the moment and teared up. I hope she knows I was praying just as much for her. Love you Kel! And last BUT not least, the AMAZING Downtown Kara Brown: Where do I even begin...Kara has been an inspiration for me for oh so long. She also went on the mission trip to the Gulf with me and that is where our friendship began. I like to refer to her as my "Social Justice Friend". If anyone is passionate about social justice it is her. We would always discuss our "plans for the future" and they all involved various ways of saving the world. She biked across the US last year to raise money for Cancer research, she is crazy, but wonderful! I was so glad to see her and talk about social justice for hours! I want her to just move to Urbana with me! I am going to miss our times together so much, but I know she is just a phone call away. Kara you are forever an inspiration to me! So after those 3 things...I woke up the next morning at Kelly's house and I just felt so at peace about everything. I was not as nervous anymore to move 12 hours away from home and start a job I have no idea how to do. I could feel the support (not that it wasn't there before) surrounding me from my friends I saw and also from so many more. I just needed that reassurance for some reason. And now I can write again. Here is a song I have already sent one friend, but I would like to dedicate this to all my good friends...thank you for your support, I love you all. Here is the link, and below the lyrics. I will write again from Urbana! I am ready for this adventure! I have been praying for all y'all. I can't believe you leave today. It will be so different. I look forward to sending you a postcard. P.S. I like the new look/format of your blog!